Submitted by lynn on Monday, September 3, 2012 - 1:57pm. On Friday, we dined out at Del Mar Rendezvous. It's a beautiful restaurant with modern dark wood tones, asian inspiration, and an extensive wine rack of which we partook later for dinner! Both the Manager Dan and Chef Tony have worked hard to continually make improvements in the experience as well as the food which has won them "best chinese" from San Diego Magazine for the past three years. One big selling point is that they have a separate vegetarian/vegan menu as well as a gluten-free menu, both with over 40 items to choose from, including gluten-free beer! It's fantastic that they are catering to more diners AND it is delicious! This had a perfect sear and a great portion of food for appetizer! The accompanying sauce is light but still gives it that wasabi bite. The ribs didn't look like they were going to be moist but after a bite we were happily proven wrong. This was like eating ribs with the yummy sweet glaze usually found on roast ducks! Even the bed of lettuce had soaked up some of the meat flavor and we ate everything off the plate except the bones of course! This traditional Taiwanese dish is a special addition to the menu for Restaurant Week. The biggest contributor to the flavor is the bone marrow... 10 minutes of cooking to get it out of the bones, plus another 15 minutes or so to get it back in to the chicken! With that much cooktime, the meat falls off the bones easily. Since the chicken is chopped into smaller pieces, there are bones but none too small that we couldn't easily find them. Added bonus: free-range chicken from their new supplier Mary's Farms in San Joanquin! Kudos for this in addition to their excellent menu! There was a nice crispiness to the huge breaded shrimp and a semi-sweet honey glaze to top it off. The walnuts made in house were crunchy goodness too. This was my favorite dishes here. The sorbet was well packed and melted ever so slowly so we were able to enjoy the sweet treat even after a couple minutes of sitting out! I love that the sorbet came in the bowl of mango peel too! Dennis was loving the sweet cinnamon crunch of this dessert! You have to try it yourself to see what the fuss is about! In addition, for restaurant week, Del Mar Rendezvous is offering diners wine pairings for either 2 or 3 courses at a discount. For lighter drinkers, there's also a 1/2 glass option! We sampled a few wines and decided to take home a bottle of Castello Banfi Rosa Regale. This one is raspberry inspired and we just couldn't resist! The restaurant also has a great selection of beer and sake with special pricing on certain nights. Del Mar Rendezvous has generously given us 2 free meals for use during San Diego Restaurant Week menu for one of our lucky readers! 3. 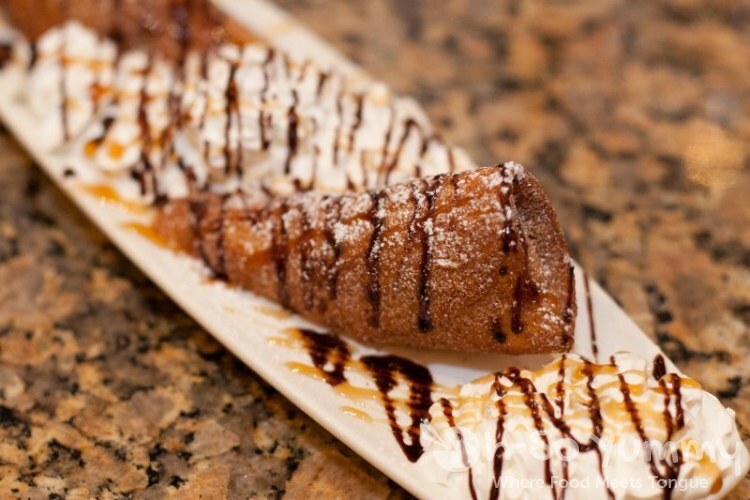 Follow us on twitter and tweet the following: "Follow us and retweet @ohsoyummyreview for a chance to win 2 dinners to Del Mar Rendezvous for San Diego Restaurant Week #sdrw"
To be fair, the only rule is that the winner must be able to physically use this prize. San Diego and nearby areas only! Contest closes on Monday September 10th 2012 at 5pm and we'll randomly pick a winner. Max three entries per person, one for each of the above. Thanks and good luck! 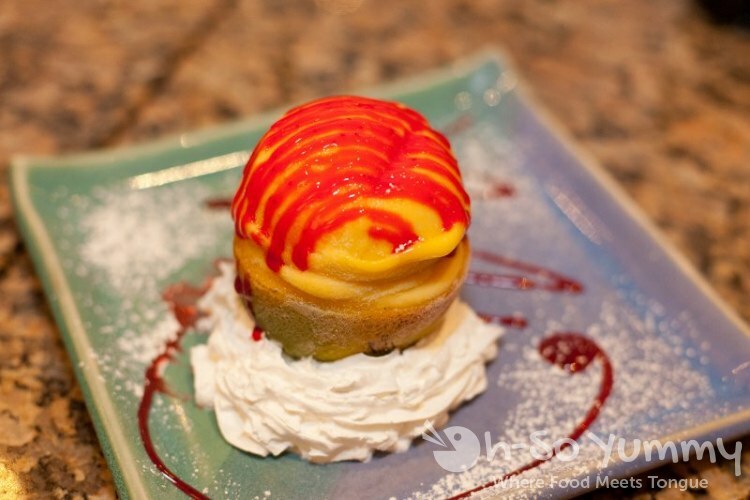 The mango sorbet looks great! I'd like to try that! 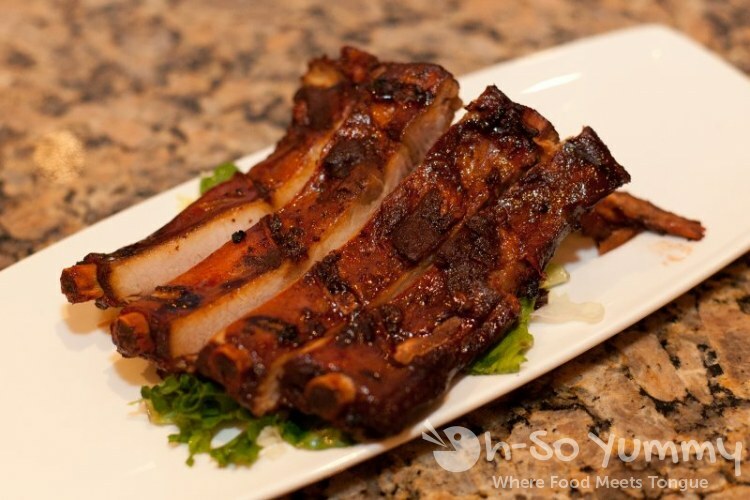 The honey-glazed spare ribs look and sound good - I'd order those for sure! Everything looks so good! But, I'd most like to try the Seared Ahi. That seseame crusted seared ahi tuna looks absolutely mouth watering. I cant wait to indulge in some of that with my husband. I also 'liked' on facebook for a second entry - fingers crossed! 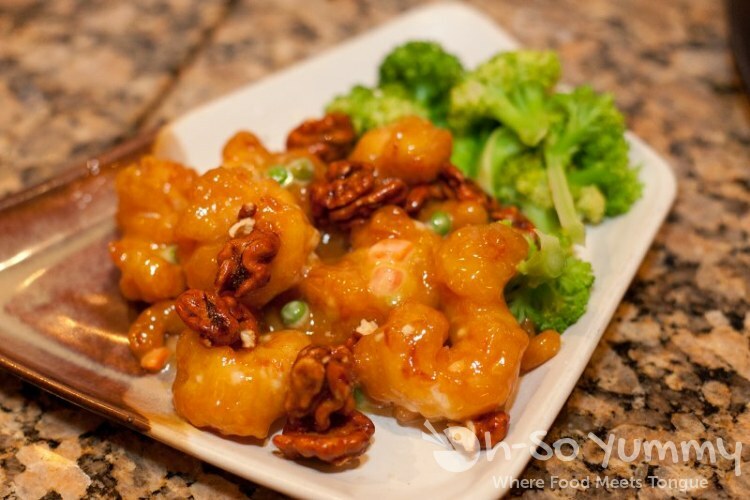 I'd love to try the Walnut Shrimp! Looks yummy! I liked your facebook page and shared the tweet. Thanks for the giveaway! Everything looks good but I don't think I've ever had anything like the Sanbeiji before so I'd definitely want to order that! Sesame Crusted Seared Ahi looks and sounds so good! Yo Lynn - good looks on this Del Mar Rendevous joint. Dropping knowlege on me like that. How did I not know about this place before? Cray cray! Cats be talkin mad game bout this place for real, son! Okay real talk - those spare ribs be looking mad serious. All y'all "foodies" better get up out my way when I roll up to this spot cuz I'ma order LIKE A BOSS! Aight I'm out. Peace! OMG the honey glazed spare ribs look divine! I would like to try the three cup chicken. I like the Shrimp with Lobster Sauce sounds yummy! Liked your new FB page. That seared ahi looks yummy :) I'd love to try it!!! I want to try them all! They all look oh-soyummy!!!! 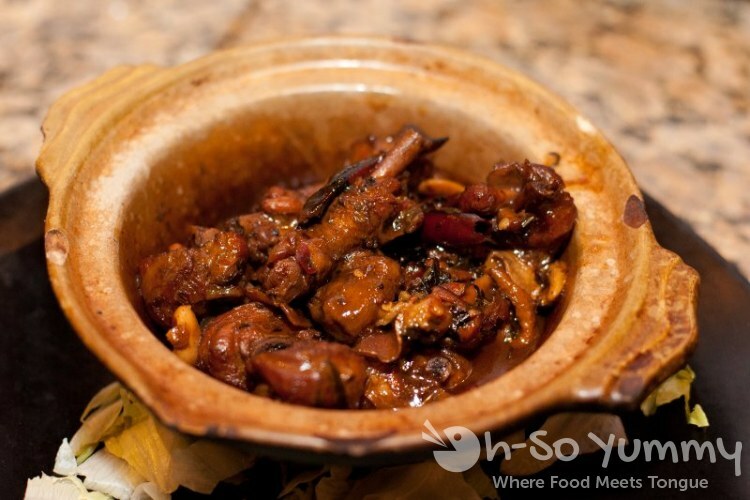 I would love to try the 3 cup chicken, one of my favorite Taiwanese dishes! I'd definitely get the Walnut Shrimp if I won. I also liked your page on facebook, and follow you on twitter (@sunnipq). I retweeted your comment as well! 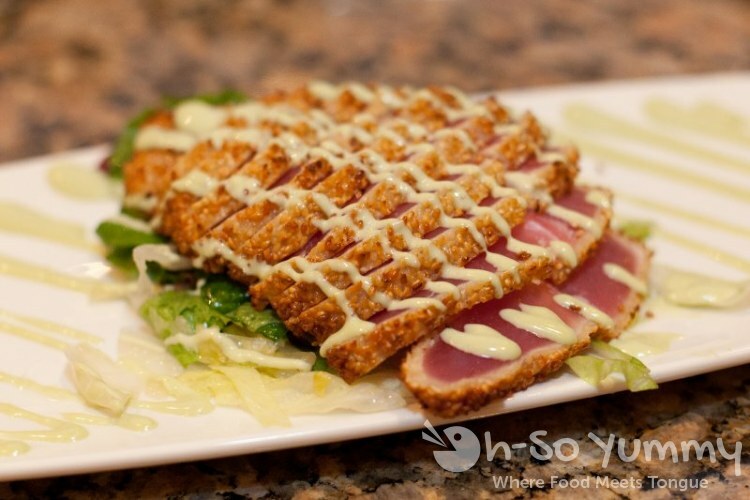 The sesame crusted ahi looks absolutely scrumptious!! Hmm I don't remember seeing the 三杯鸡 in Taiwan... I wonder how I missed it, sounds pretty good though.